The Bureau of Juvenile Justice Services (BJJS) is responsible for the management, operations, program planning and oversight of all the youth development center/youth forestry camp facilities. These facilities are designed to provide state-of-the-art treatment, care and custody services to Pennsylvania’s most at-risk youth. The youth entrusted to our care are male and female adolescents who have been adjudicated delinquent by their county judicial system. From the time of referral, we ensure that every youth receives individualized treatment services based on his/her strengths and needs. BJJS treatment services value strong child, family and community partnerships, promote competency development and victim awareness, while advocating for the continued improvement and integration of all child-serving systems. All aspects of the BJJS facilities are based on the Restorative Justice concept thereby ensuring that all the facility programs provide equal attention to the victim, the youth, and the community. The BJJS is committed to supporting the building of strong communities and serving as a model for juvenile justice services, while fostering hope and the opportunity for success. The Department of Human Services’s (DHS) Bureau of Juvenile Justice Services (BJJS) is responsible for the administration, management, and oversight of Pennsylvania’s public facilities for adjudicated delinquent youth and to enhance the quality and coordination of juvenile justice services throughout the Commonwealth to achieve our mission of Balanced and Restorative Justice. In 1956, the DHS established youth forestry camps (YFCs), which were located in more remote areas of the state. Currently, there are two camps in operation: YFC #2 and YFC #3. In 1959, the DHS established youth development centers (YDCs). Today, there are three centers in operation: South Mountain Secure Treatment Unit, North Central Secure Treatment Unit, and Loysville Youth Development Center. Support youth towards independence to become productive, contributing citizens and juvenile justice system improvement. The Bureau of Juvenile Justice Services (BJJS) will provide a system of individualized treatment services that values strong child, family and community partnerships; promotes competency development and victim awareness; and enhances the quality and coordination of our juvenile justice system. COMMITMENT TO ACTION: We pledge to encourage and support those who serve youth, families, and the broader juvenile justice community. RESPECT: We extend consideration and appreciation to youth, families, employees and stakeholders by fostering a fair, open and honest environment and workplace. We listen to the ideas and opinions expressed by others and treat them as we would wish to be treated. INTEGRITY: We uphold a standard of transparency, professionalism, accountability and reliability. We conscientiously and cost effectively manage our operations to promote a workforce and provide services that are worthy of the public trust. DIVERSITY: We value our customers and employees through inclusiveness and demonstrating respect for their perspectives and backgrounds. ENTHUSIASM: We embrace our work and the challenges of the future with optimism and are open to the myriad of possibilities that may accompany change. QUALITY: We fulfill our mission by providing relevant, timely, and effective services. INNOVATION: We constantly seek new ways to accomplish our work and to generate extraordinary results. We are dedicated to delivering creative and forward thinking solutions. COMMUNICATION: We strive to be inclusive, transparent and open in our conversations, both written and oral. COLLABORATION: We strive to be inclusive, transparent and open in our conversations, both written and oral. The Bureau of Juvenile Justice Services is continuously improving the quality of services provided in the YDC/YFC. In order to ensure the health and safety of residents and staff, the YDC/YFC system has implemented the Performance-based Standards (PbS). Developed by the U.S. Office of Juvenile Justice and Delinquency Prevention to improve conditions of confinement at juvenile facilities, PbS sets national standards for safety, education, health/mental health services, security, and justice. PbS provides agencies with the tools to collect and analyze data to design improvements, implement change, and measure effectiveness. The Division of Quality Assurance is engaged in an effort to improve the overall quality of interventions and response to juvenile offending throughout the system. The strategy is to improve overall effectiveness by supporting primary services (i.e. cognitive behavioral therapy, group counseling, and family counseling) to include Evidence Based Programming. BJJS is supportive of developing a consistent and systematic approach to reviewing and approving services that have been designed to reduce future delinquency. As a system we strive to ensure that programs and policies meet the criteria for effectiveness as established by empirical, validated and data driven research. Research shows that when youth’s criminogenic needs are matched with services and programs depending on the effectiveness of that particular service will reduce recidivism of juvenile offenders. 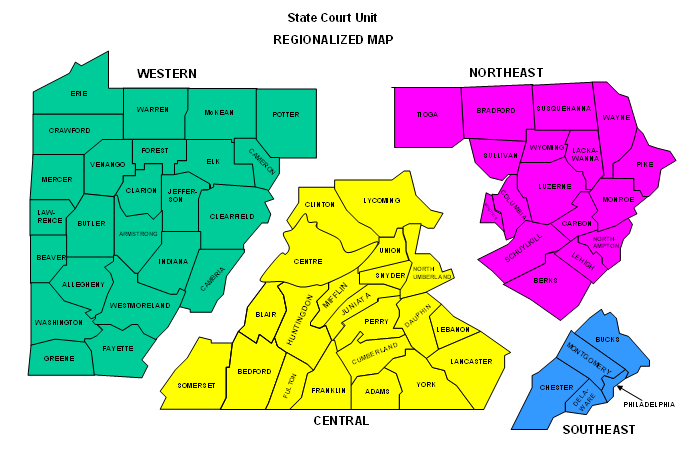 Committed to serving the citizens of Pennsylvania, the State Court Liaison Unit (SCU) directs the admissions of court-committed residents to the YDC/YFC system. The SCU ensures that care and consideration are given to the victims of juvenile crime, the communities in which they reside, and the juvenile offender with his or her unique set of problems. The SCU makes recommendations to juvenile courts regarding what programs and/or facilities will best address the needs of the resident being placed. Responding to the many demands of the Pennsylvania juvenile court system requires that the SCU’s personnel maintain a current working knowledge of juvenile justice initiatives, such as JJSES, a keen understanding of the Pennsylvania Crimes Code and the treatment approaches being utilized within the YDC/YFC system’s programs. State Court Liaison Program Specialists may also be called upon to provide testimony at juvenile court hearings. The State Court Unit operates regionally, with offices located throughout the state. Counties that have juvenile referrals or would like to learn more about the YDC/YFC programs should contact the liaison for their respective region/county to begin the enrollment process to the DHS YDC/YFC System. The YDC/YFC system seeks to provide the highest quality interventions and to respond to the changing needs of the youth entrusted to its care. One strategy for accomplishing these goals is to improve our effectiveness by supporting evidence based programming and ensuring that these services are of quality and are implemented with fidelity. ARISE Anger Management Lessons consists of 9 lessons designed to be taught in nine sessions of approximately 30 – 60 minutes each. The lessons are flexible to allow facilitators to plan individualized courses of study depending on youths’ ages and needs. The Crossroads Anger Management curriculum offers 2 coursework levels: Level I includes 8 hours of classroom material designed to be taught in two 2-hour sessions per week for 2 weeks (four sessions total) and Level II includes 12 hours of classroom material designed to be taught in two 2-hour sessions per week for 3 weeks (six sessions total). Level II includes all Level I material plus additional components. The core of the Thinking for a Change (T4C) curriculum is a problem-solving component embellished by cognitive restructuring and social skills interventions. The three components are blended together in 22 weekly lessons of approximately two hours duration each. T4C is designed to be a close ended group in which the lessons are sequential and all participants begin with Lesson 1 and proceed in order. In high turnover situations or situations where participants are moved to different facilities, they could enter a group in Lesson 10 or 16. Aggression Replacement Training (ART) is a cognitive behavioral intervention program to help children and adolescents improve social skill competence and moral reasoning, better manage anger, and reduce aggressive behavior. The program specifically targets chronically aggressive children and adolescents ages 12-17. Developed by Arnold P. Goldstein, Barry Glick, and John Gibbs. Aggression Replacement Training has been implemented in schools and juvenile delinquency programs across the United States and throughout the world. The program consists of 10 weeks (30 sessions) of intervention training, and is divided into three components—social skills training, anger-control training, and training in moral reasoning. Clients attend a one-hour session in each of these components each week. Incremental learning, reinforcement techniques, and guided group discussions enhance skill acquisition and reinforce the lessons in the curriculum. A New Direction (AND) is a cognitive-behavioral treatment curriculum published by the Hazelden Company. It is composed of a six workbook series including: Intake & Orientation, Criminal & Addictive Thinking, Drug & Alcohol Education, Socialization, Relapse Prevention, and Release & Reintegration Preparation. More information about this service and other Hazelden materials can be found at www.hazelden.org. Project Towards No Drug Abuse (PTND) is a drug prevention program for high school youth who are at risk for drug use and violence-related behavior. The current version of the Project TND curriculum contains twelve 40-minute interactive sessions taught by teachers or health educators over a 3-week period. Sessions provide instruction in motivation activities to not use drugs; skills in self-control, communication, and resource acquisition; and decision-making strategies. The program is delivered universally and has been used in both traditional and alternative, high-risk high schools. BJJS is engaged in a continuous effort to monitor and improve the overall quality and fidelity of deliverable services to our juveniles throughout the YDC/YFC system. BJJS’s QIR process has been implemented to monitor and improve the delivery of Evidence Based Programs (EBP) by ensuring staff are properly trained, protecting against fidelity drift and maintaining proper structure according to the service model. Once a review is completed, BJJS representatives assist facilities in developing corrective action plans in order to address deficiencies identified during the review process. Ultimately the QIR process helps to ensure our residents are receiving the highest quality services available to aid in their success and to protect against recidivism.